Yogurt is a massive part of a lot of our diets, it is healthy, features in a huge amount of meals both savoury and sweet. However, we often wish we could adjust the yogurt according to our flavour and get exactly what we want. Well now you can definitely do that because there are plenty of yogurt makers that can help you get the taste you desire. One of which is the Yogourmet, which we’re going to be looking at today. Yogurt makers vary depending on the make or model and you are given the possibility of choosing between simple manual makers, semi manual makers or fully automatic ones. If you need a basic maker that can easily turn your milk into a cup of yogurt then Yogourmet Electric Yogurt Maker might be a perfect fit. 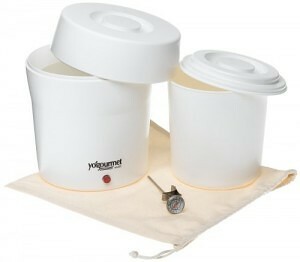 Yogourmet Electric Yogurt Maker has very clean, simple look. It consists of big container with a lid, which is actually the base of the maker, a smaller container with a lid as well, thermometer and additional cotton bag. In addition the package usually includes a book of recipes that will give you more ideas on how to make different flavours and experiment with fruit yogurt or even make cheese using the cotton bag. Once you get this maker you will be just a step away from having unlimited quantities of yogurt whenever you want. The base container has double layers. Between the layers it is filled with water which helps control the temperature in the maker. It also has a thermometer engraved both with Celsius and Fahrenheit measures to allow you to have a constant insight on the temperature of the maker. The container can fit up to two litters of yogurt, which enables you to make a quantity that is sufficient for the entire family. The lid of the inner container can be firmly closed enabling you to store the yogurt for further use. These containers can also be both separately from the maker in case you need to have more than one, and store different flavours of yogurt at the same time. The containers are made of BPA and PVC free plastic so they will not endanger your health. Making the yogurt itself is a piece of cake. All you have to do is preheat the milk, pour it into the inner container and place it into the base container. You should close the maker and plug it in. 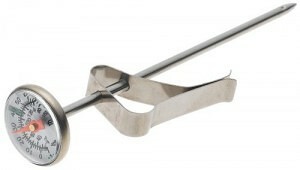 After 6 to 8 hours depending on the type of yogurt you are making, your product will be ready. For the entire time you can follow the temperature inside the maker to make sure everything is going according to the plan. Hopefully with these few simple steps you have seen how easy it is to make delicious homemade yogurt. Once you try one of your own recipes you will never buy yogurt again. The Yogourmet Electric Yogurt Maker will make a real revolution in your kitchen and it will help you have your favourite fresh yogurt always at your disposal. The Yogourmet has exceptional reviews on Amazon and other online retailers, with the vast majority of people giving it a five star review. It is mid range in terms of price but its features are definitely high end. This entry was posted in Yogourmet.